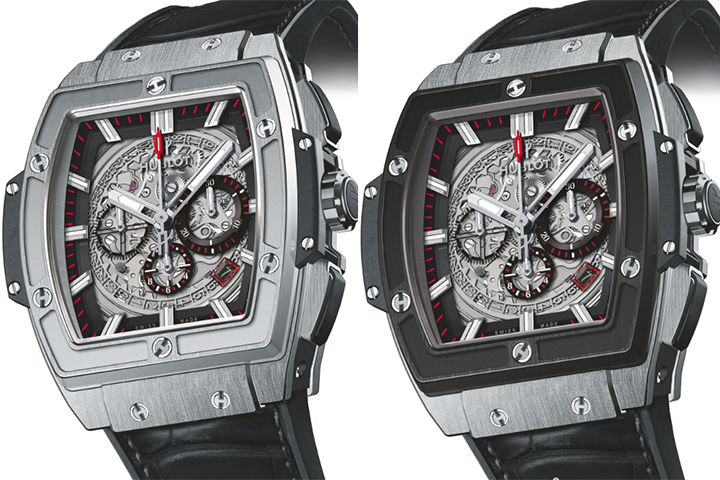 Watch Battle: Hublot "Spirit of BIG BANG" vs Hublot "BIG BANG"
Geneva Seal Fine Jewelry & Timepieces in Chicago is raining new watches and new movements from the fastest growing watch brand Hublot. The "Spirit of BIG BANG" indeed embodies the spirit of Hublot's "BIG BANG" watch. It features the BIG BANG codes with its 6 H-shaped titanium screws through the watch bezel, the lugs on either side, the two strap attachments, Hublot's famous hands and the SuperLuminova-filled baton indices offering superb legibility, and the overmoulded rubber screw-down crown with the iconic letter H adorning its profile. Here we find Hublot's pure DNA, but in a different form. The "Spirit of BIG BANG" has a beating heart that is different than the "BIG BANG" with the Hublot HUB4700 movement, redesigned through close collaboration between Hublot and Zénith teams; based on a Zénith El Primero chronograph "chassis" with date (frequency 5 Hz, 36,000 beats per hour, 278 components, 31 jewels), this movement has historically been regarded by purists as one of the best Swiss chronographs ever developed. Small counter at 6 o'clock (hours). Zénith El Primero base given a pure Hublot look. Oscillating weight Special "Spirit of Big Bang" design. Now, for a closer look at Hublot's BIG BANG Aero Bang Watch. 44mm stainless steel case, stainless steel bezel, black skeleton dial, self winding HUB 4214 movement with skeleton chronograph function, black rubber-gummy alligator strap with deployant buckle. Water resistant to 100 meters.